After just a few weeks of intravenous vitamin C injections, Ozone therapy and manic supplement buying, Mum’s credit card had taken a battering. While Mum has been lucky enough to be able to afford these things, for many people alternative cancer treatments can be financially crippling. Why? Unlike radiotherapy and chemotherapy they are seldom covered by health insurance. So I’m happy this week to talk about a therapy that’s cheap, simple and which has paved the recovery for thousands of cancer patients. 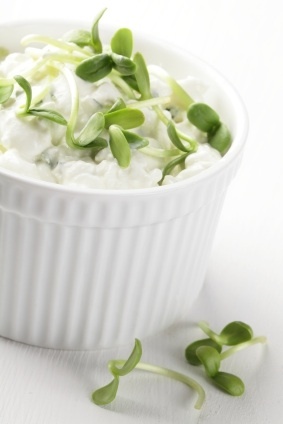 No appointments or airfares required for this one, all you need to start the Budwig Diet is a tub of cottage cheese and a bottle of flaxseed oil. Bill became interested in alternative cancer treatments following his late wife Marjorie’s four-year battle with ovarian cancer. Bill maintains that Marjorie’s death was not the result of the cancer itself, but rather the endless rounds of chemotherapy she endured. 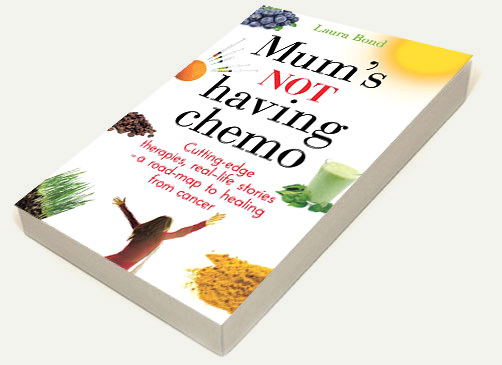 After witnessing the pain she suffered, Bill embarked on more than a decade of research into alternative therapies and eventually stumbled upon the Budwig Diet which is now the backbone of his anti-cancer programme. Flaxseed oil is packed with omega 3 fatty acids, a group of nutrients that most of us have heard of by now. While the brain-boosting and anti-inflammatory properties of omega 3 have received a great deal of coverage in recent years, the role this vital nutrient plays in oxygenating our system is perhaps less well known. ‘Omega 3 works like a magnet on the cell membrane, attracting oxygen to the cell and also causing the oxygen to enter the cell,’ explains Bill Henderson in Cancer Free. Since flaxseed oil can oxygenate the blood, you might then wonder why the cottage cheese is required? The answer is simple. When you blend cottage cheese with flaxseed oil, the mixture becomes water-soluble and thanks to this water solubility the omega-3 fatty acids are effectively delivered to the cells. But Aren’t Dairy Products Bad? 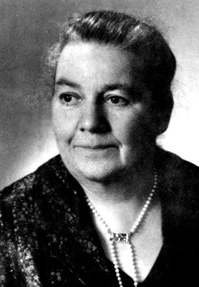 In the 1950s Dr Johanna Budwig, one of Germany’s leading biochemists – and seven time Nobel prize nominee – discovered the right combination of essential fatty acids (found in flaxseed oil) and sulphur-based proteins (present in cottage cheese) could kill off cancer cells. After collecting and analyzing thousands of blood samples Dr Budwig discovered that the samples of the seriously ill (including cancer patients) were always deficient in one vital fatty acid – linoleic acid. She also found that the patients were often lacking albumin (a combination of linoleic acid and sulphur-based protein). Dr Budwig hypothesized that those suffering from serious illnesses could be returned to health by eating a diet high in these essential nutrients. Budwig tested her theory by feeding cancer patients a combination of 40 grams of flaxseed oil mixed with 100 grams of skim-milk proteins (the latest Budwig formula recommends low-fat cottage cheese in its place). Over a period of weeks, she noticed the tumours gradually receded. Since that time, thousands of people struggling with cancer– including those dealing with brain cancer and bone cancer – have become healthy again using this simple diet. Dr. Budwig (who died in 2003 at the age of 95) claimed to have had over a 90% success rate with her diet and protocol with all kinds of cancer patients over a 50 -year period. 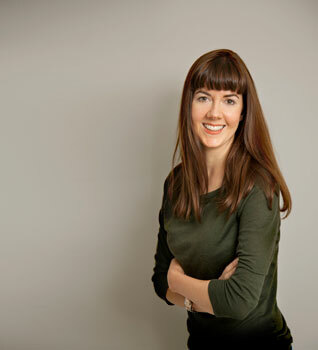 Dorothy McCord, who had liver cancer, ovarian cancer (with metastasis) and a low-grade brain tumour saw a dramatic shift in her condition after starting the Budwig Protocol. ‘He [Keith] was immediately started on an intensive program of radiation treatments, but still no improvement was noted. This young high-school track star said he would rather face death than lose his leg. The situation appeared hopeless. Keith’s distraught parents consulted with the most eminent doctors they could locate in many areas, but all confirmed the frightening prognosis. 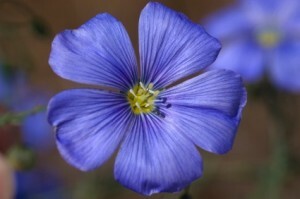 Recent research supports Dr Budwig’s theory that flaxseed oil is like kryptonite to cancer cells. According to one Polish study the active elements in flaxseed oil kill cancer cells while bypassing healthy white blood cells. Another recent French study found that low levels of alpha-linolenic acid (found abundantly in flaxseed oil) were a predictor of increased risk of breast cancer. The study was published in the February 2000 issue of the European Journal of Cancer. Make sure the flaxseed oil you buy is cold-pressed, virgin, unrefined and raw. The valuable (anti-cancer) fats in flaxseed are removed during the refining process that most commercial oils undergo. This routine process can include heating, bleaching, deodorizing, ‘defoaming’ as well as the addition of chemical preservatives. It’s also vital to refrigerate flaxseed oil and keep it away from sunlight since the oil oxidizes very rapidly. It must be low fat (less than 2%) and preferably organic. The basic Budwig Diet consists of a daily dose of one or two tablespoon of flaxseed oil blended with half to one cup of low-fat cottage cheese. Seriously ill patients, including cancer patients, may need to consume higher quantities than this however I would strongly recommend that anyone considering this diet first consult a qualified practitioner and read all of the supporting literature on the subject. To produce the chemical reaction required for it to be a potent cancer fighter, the cottage cheese and flaxseed oil MUST be machine blended. Mum uses a hand-held immersion blender (previously reserved for vodka spaghetti sauce) to ensure the oil permeates the cottage cheese completely. She then adds a mixture of frozen berries and occasionally a teaspoon of stevia to sweeten her Budwig breakfast. You can ‘bespoke’ your Budwig by adding fresh herbs, raw vegetables, fruits, cinnamon, raisins… the list is endless. Fisher suggests adding finely grated cucumbers and radishes with some chopped tomatoes and a crumbling of dill. It’s important to blend the cottage cheese and flaxseed oil first – to ensure they’re properly homogenized – before adding the other ingredients. If you’re interested in a coaching session with Bill Henderson ( he charges $180 for the service) click here. To read more about the Budwig Protocol go to the Budwig Centre website or scroll through the detailed report about it on the Cancer Tutor. Finally, I just wanted to say a huge thank you to all the people who got in touch following the piece that appeared in The Sunday Times Style Magazine in London. The emails were so uplilfting and I’m sorry that I haven’t yet had a chance to respond to all of you – being a one man band can make it tricky. Firstly, after Melbourne I got withdrawal symptoms & miss your girls heaps!! Secondly, I’ve been following this breakky religiously since I returned. When my kids got intrigued & asked me about it, I simply told them ‘this is Gemma’s breakfast’ so that is how it is now know in this household, ‘Gemma’s breakky’!! It makes a great start to the day & is quite light. My daughter adds Maple Syrup to hers but I’m happy with just a handful of frozen mixed berries. I began using The Budwig Diet maybe 6 weeks ago, when my Naturopath suggested I try it, after I found out my lung cancer had begun to grow again. ( I have contacted you before). I’m using organic flaxseed oil that I purchase from Peaches in fremantle. 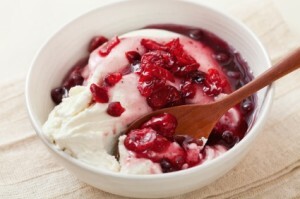 I’m using organic Quark instead of Cottage Cheese.. it is much easier to eat, it is more like yoghurt. It’s only another 3 weeks ’til I find out if my adding other things to my daily routine, to see if I’ve been able to stop my cancer growing again. I’m feeling very well, so am thinking all will be fine when I go for my results 🙂 I also am adding wheat grass to my vege juice, I make fresh every morning. Will let you know my results when I get them.